Polytope is performed by Erin Barnes, Cory Beers, Daniel Corral, and Andrew Lessman. Polytope by Los Angeles composer Daniel Corral is a multimedia microtonal performance for MIDI quartet. 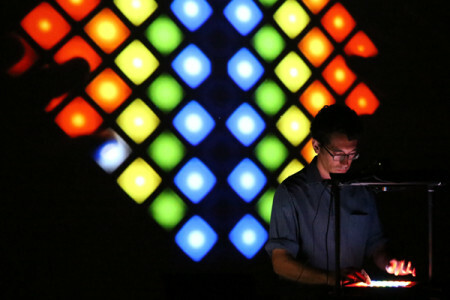 Performed entirely in darkness, four live musicians operate colorful glowing MIDI controllers. It’s a mesmerizing dance of silhouettes, captured on live feed video and projected large and bright as a moving, visual score. Polytope is rhythmically charged in the vein of musical minimalists such as Phillip Glass, Steve Reich, or Arnold Dreyblatt, but harmonically inspired by the microtonal explorations of James Tenney, Erv Wilson, or Harry Partch. The multimedia style of presentation is somewhere between a string quartet, Kraftwerk, James Turrell, and an Indonesian dhalang (master shadow puppeteer). Onstage, four MIDI controllers sit on a small square table. A single video camera captures the view from above. The controllers are not traditional keyboards; they are glowing grids of 8×8 buttons, rotated 45° to create tonality diamonds. One musician stands before each controller. In the dark, the overhead camera captures the colorful, changing patterns of grid lights and the fast-moving silhouettes of the musician hands. The live feed video is projected in the space, creating a larger than life, colorful multimedia experience inspired by Light and Space art that also acts as an evolving, visual score.